I think we all have moments, stories, images from our childhood that leave an indelible mark on our personality. These experiences, either consciously or subconsciously, become part of how we define our life’s path as an adult. 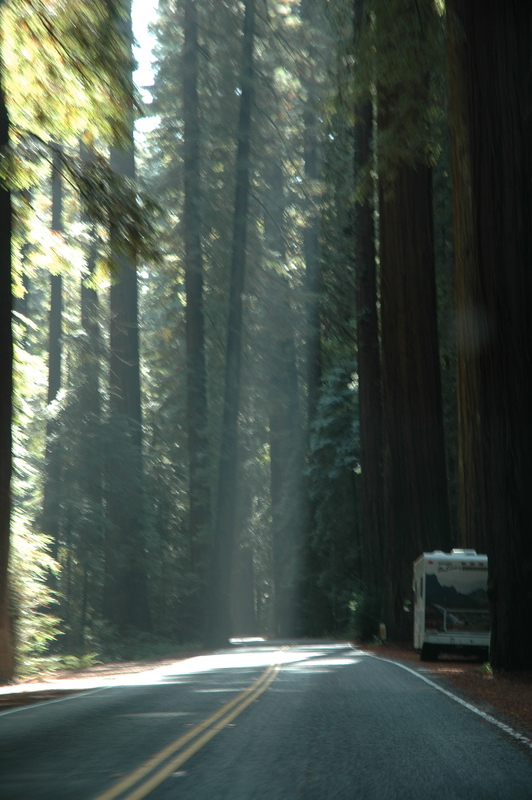 For me, one of those moments was listening to my mother talk about driving through the Redwoods with my father. 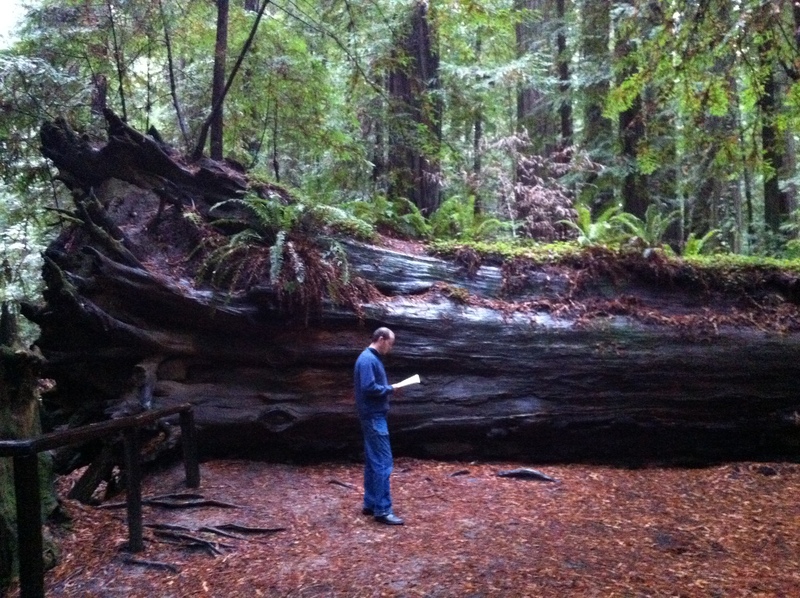 The image of these huge trees seemed magical, a forest Camelot hidden away somewhere on the California coast. Now 20 years later, here I am standing, in the rain and the fog, amongst these huge trees that part of me didn’t actually believe existed. They are so huge that it is hard to even conceive of their grandeur. With the older trees at over 300 feet tall, it seems as though you must stand at least a football field’s distance away from them to even begin to get a sense of the whole tree in one glance. Any closer and you have three separate images in your head – trunk – body – canopy – that then have to be pieced together like a mosaic to form an idea of the whole tree. In the rain the trees take on a life of their own. I get the sense that I am intruding on their turf, trespassing on the land they have claimed for hundreds or for some, thousands of years. How could pioneers have come here 150 years ago and not been intimidated by these huge beings? Obviously, they weren’t intimidated. Within 100 years of the arrival of the first white pioneers, 95% of the original old growth redwood forest had been logged. The state was booming and lumber was needed for housing, railroads, and other infrastructure. 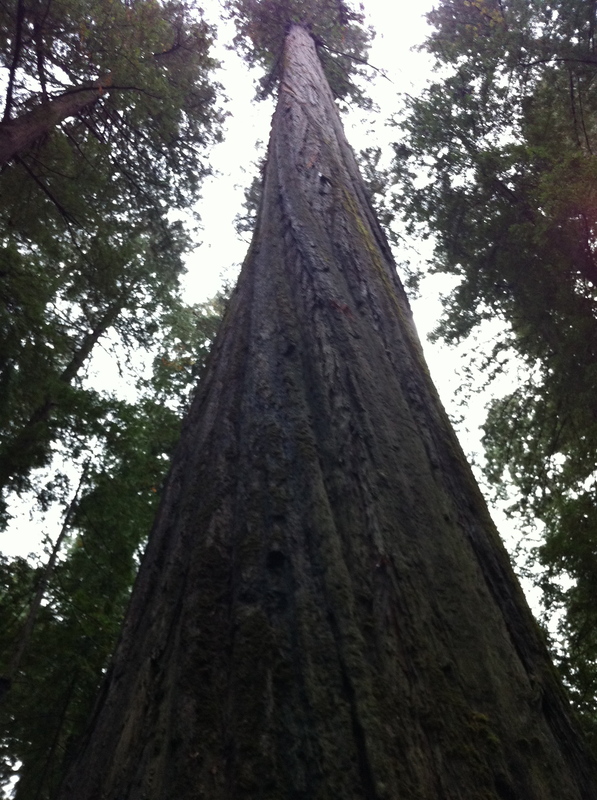 If it had not been for a small group of concerned citizens, the remaining 5% would have been lost and the majestic redwoods would have only been nothing more than an idea to my generation. That realization, that this experience could have been taken from me in the name of profits and economic necessity, makes those “crazy people” that chain themselves to and live in trees seem not quite so crazy. If I had grown up with these trees and then had to watch them being destroyed, I think I’d be pulling out my chains as well. That is why travel is so vital. It creates the context, the interconnectedness, and the self-realization that is so important in so many parts of life. – Somewhere between the “crazy tree huggers” and “money hungry companies”, are a vast number of people, organizations, and companies working to preserve the forests while looking for ways to sustainably maximize profits. For a great overview on the redwoods and to learn more about the latest ideas on sustainable logging, check out National Geographic Magazine from October 2009.